I am trying to prepare myself for instruction with close reading this year. There are so many great resources out there, and I want to make sure I am well-equipped to use the strongest elements of close reading in my classroom this year. At the same time, I don't want to have too much extra "stuff" to distract myself. 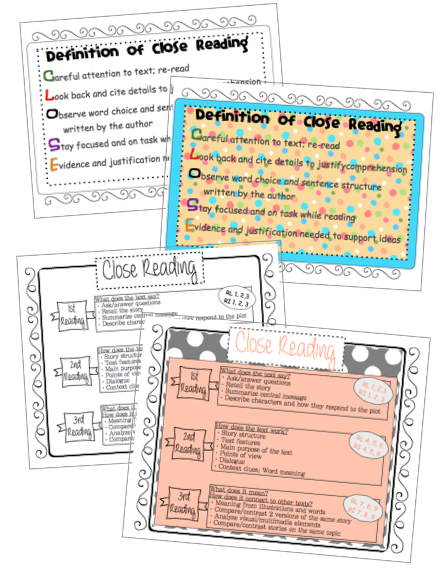 a colorful, visually-appealing poster that defines Close Reading based upon an acronym for "CLOSE"
a black-and-white poster that defines Close Reading based upon an acronym for "CLOSE"
a black-and-white poster that outlines the process for multiple readings of a text, as well as the Common Core standards that align to each level of questioning. I am trying to be more considerate of the use of ink (or lack, thereof) in the products I create. I love to create colorful designs. However, in considering my own experiences with TPT products, I have found myself to be extremely grateful for those products that contain a black-and-white option. While those colorful designs are cute, all of that printing can take a toll on your ink levels and, consequently, your pocketbook! So I tried to take this personal preference into consideration when revising this product. I'm not sure if everyone feels the same way that I do, but it's worth the extra time to provide the option for those who are conscientious of their printer ink levels! If you are interested in these products, you can access them at the Tally Tales TPT store here. Do you have any other suggestions for creating TPT products? What details are you particularly grateful for when you make a purchase? Any feedback is welcome! Thanks!